The RAIN RFID Alliance meeting is coming up on July 18-20 in Seattle. We are proud to be RAIN charter members, following the highest quality RFID standards. The sessions on July 20th are free and open to the public. 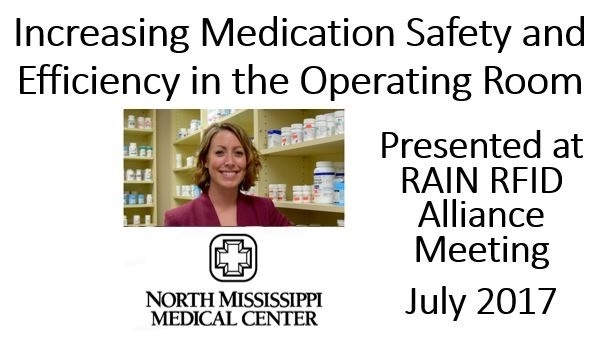 We are especially excited about “Increasing Safety and Efficiency in the OR”, which will be presented by Emily J. Tschumper, Pharm. D., MS, of North Mississippi Medical Center along with Paula Dycaico of Intelliguard® RFID. North Mississippi Medical Center (NMMC) has launched the revolutionary new Intelliguard® RFID RAIN-enabled Linked Visibility Inventory System™ in their operating rooms for securing, managing and tracking medication and narcotics. With its RAIN-enabled secure drawers and top surface for tracking medications “in process,” Intelliguard® LVIS™ is the first RAIN-enabled dispensing system in the operating room (OR), providing increased medication safety and workflow efficiency through true RAIN RFID automation. Speakers from NMMC and Intelliguard® RFID will discuss the process improvements and positive results gained from implementing LVIS™ in the OR; what broader needs LVIS™ is serving in the healthcare industry; and how the product development process was undertaken. The Intelliguard® LVIS™ simplifies anesthesia medication management. Data is automatically captured and timestamped on every medication removed or returned each time an LVIS Station™ drawer is closed – with no scanning or manual recording required from the care team. Anesthesiologists simply open a drawer, use what’s needed and close the drawer, while the LVIS Station™ relays precise inventory details to the pharmacy in real-time for every transaction, every minute of every day in every room. RAIN RFID is a wireless technology that connects billions of everyday items to the internet, enabling businesses and consumers to identify, locate, authenticate, and engage each item. RAIN RFID Alliance members include forward-thinking, innovative companies such as Google, Amazon, Impinj, and Intel. RAIN RFID solutions in healthcare are proven to improve safety, reduce inventory costs and increase efficiency. >>Learn more about RAIN RFID in healthcare. If you have any questions about RFID in healthcare or would like to learn more about LVIS™, please contact us. We hope to see you in Seattle!